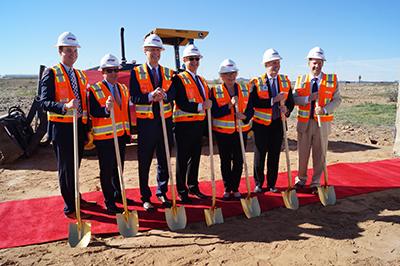 SCOTTSDALE, Ariz. (Dec. 5, 2018) — HonorHealth broke ground on its sixth hospital today at Interstate 17 and Dove Valley Road in north Phoenix. 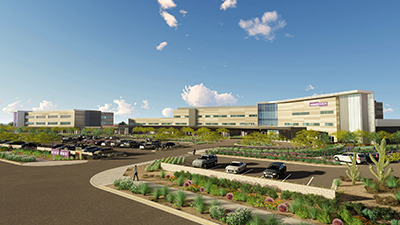 The three-story, 210,000-square-foot HonorHealth Sonoran Medical Center will be built on the campus that currently houses the Sonoran Health and Emergency Center. The site will include an inpatient hospital, ambulatory surgery center and outpatient center to meet the growing health and wellness needs of north Phoenix and Anthem residents. 40 inpatient beds with the ability to expand as needs for services increase. Comprehensive obstetrical and gynecological care, including prenatal and postpartum care, labor and delivery services, and a Level II neonatal intensive care unit. Surgical services with state-of-the-art technology and clinical expertise in joint replacement and minimally invasive orthopedic, spine and general surgery procedures, treatments and therapies. 24-hour emergency care for patients of all ages with staffing from residency-trained, board-certified emergency physicians using the latest technologies and treatments. "Building on a century-long legacy of caring for our community, the HonorHealth Sonoran Medical Center will provide enhanced medical services — including labor and delivery — to residents of north Phoenix," said Kim Post, HonorHealth CEO-hospitals and chief clinical officer. "The new hospital represents HonorHealth’s commitment to improve the health and well-being of patients in the fast-growing communities of north Phoenix and Anthem. We’ll provide comprehensive care that’s close to home." The existing Sonoran Health and Emergency Center, which serves 17,000 patients annually, will become an outpatient center that includes a Breast Health Center, medical imaging services and space for future expansion. In addition, a new ambulatory surgery center on the campus will offer cost-effective, same-day surgical services and will house obstetric, pediatric, orthopedic and general surgery physician offices. Slated to open in September 2020, the HonorHealth Sonoran Medical Center represents an investment of $170 million. HonorHealth is a non-profit, local community healthcare system serving an area of 1.6 million people in the greater Phoenix area. The network encompasses five acute-care hospitals, an extensive medical group, outpatient surgery centers, a cancer care network, clinical research, medical education, a foundation and community services. HonorHealth has approximately 11,500 employees, 3,700 affiliated physicians and 3,100 volunteers. HonorHealth was formed by a merger between Scottsdale Healthcare and John C. Lincoln Health Network. HonorHealth’s mission is to improve the health and well-being of those we serve. Learn more at HonorHealth.com.